Sadako Alison Yamanaka receives honorary degree from Woodbury University. Sadako Alison Yamanaka receives an honorary degree from Woodbury University in a ceremony at the Hawaii State Capitol. She was a fashion design student in 1942. HONOLOLU – Appreciation doesn’t diminish with the passage of time. For Woodbury University and one of its fashion design students — Sadako Alison Yamanaka (Watanabe), now 93 — the appreciation is mutual. In ceremonies on Nov. 14 at the Hawaii State Capitol, Woodbury awarded an honorary bachelor of fine arts degree in fashion design to Yamanaka, who would have graduated with the Class of 1942. Among those making the presentation: Dr. Luís María R. Calingo, Woodbury president, and Rep. Joseph M. Souki, speaker of the Hawaii House of Representatives and a graduate of Woodbury’s Class of 1954. Alison Watanabe left her home on Maui to enter Woodbury College in September 1940, majoring in executive fashion arts. In the wake of the Dec. 7, 1941 attack on Pearl Harbor, she made the decision to leave California and move to Colorado. She was just six months shy of graduating, but, owing to the disruption of the war, never earned her degree. 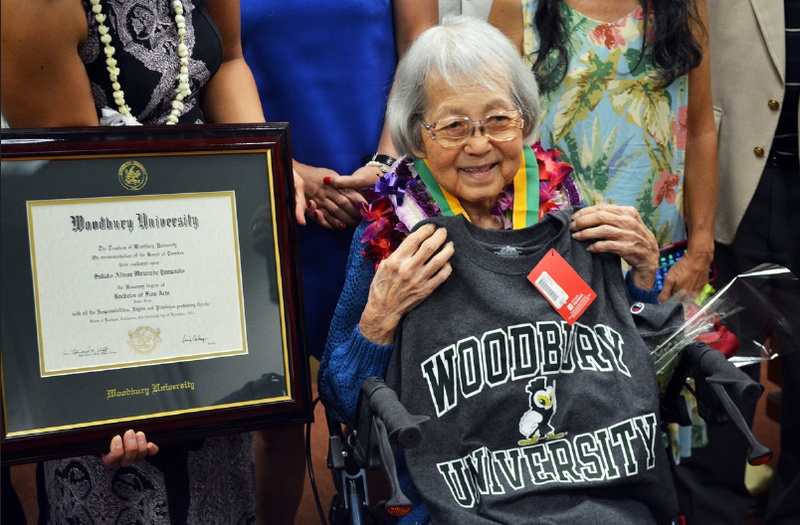 “I am so grateful to Woodbury University for presenting me the diploma, which I was unable to obtain due to World War II,” Yamanaka said. “I really never expected to receive anything once the events after December 1941 took place. What a special honor this is, beyond anything I dreamt. “To My Diary: Memoirs of My Parents” focused on her parents’ immigration to Hawaii from Japan, then her growing-up years on Maui. The second booklet, “Me the Journee,” describes her memories coming of age amid the simple island life of Hawaii and traveling to the mainland during World War II; included in that volume are her experiences attending then-Woodbury College and the subsequent interruption by the war. Founded in 1884, Woodbury University is one of the oldest institutions of higher education in Southern California. It offers bachelor’s degrees from the School of Architecture, School of Business, School of Media, Culture & Design, and College of Transdisciplinarity, along with a Master of Arts in Media for Social Justice, Master of Architecture (MArch), Master of Interior Architecture (MIA), Master of Science in Architecture (MSArch), and Master of Leadership. The San Diego campus offers Bachelor of Architecture and Master of Architecture degrees, as well as an MSArch degree with concentrations in real estate development and landscape + urbanism. Woodbury ranks 15th among the nation’s “25 Colleges That Add the Most Value,” according to Money Magazine. Visit www.woodbury.edu for more information.